It was great to see so many youngsters out enjoying themselves at Lackford Lake, on Saturday, as the Suffolk Guides held their annual ‘Get Wet Day’. 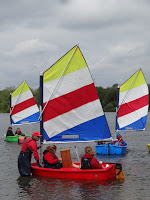 Over 60 guides from across the county braved the rather chilly conditions to venture out on the water in a variety of sailing dinghies; kayaks and rafts. On Sunday, SESCA club racing took place for the Tulip Trophy in fairly blustery conditions. In the first race Vicky Forkes led off the start in her Topper and was looking good for a handicap win until the fleet sailed into a large wind shadow at the windward mark. At the finish Mike Steele, sailing a Laser, just managed to get ahead of Jon Holmefjord (Laser) and held his time on handicap to win by ten seconds from Carl Day and Alan Shaw (Enterprise) with Jon Holmefjord finishing third. After a course change, Mike Steele got away for a clean start in the second race and led to the finish. Vicky Forkes and Debs Steele had a great battle in their Toppers with Vicky finishing just ahead on this occasion. The final pursuit race saw the early starting Toppers eventually overhauled leaving Mike Steele first; Carl Day and Alan Shaw second and Jon Holmefjord third. Next weekend sees the St Edmundsbury Sailing & Canoeing Association Open Weekend which is being held as part of the RYA’s ‘Push The Boat Out’ initiative to encourage everyone to get out on the water and celebrate a national weekend of sailing. Weather permitting, sailing taster sessions will be held from 10.30 am to 4 pm on each day.